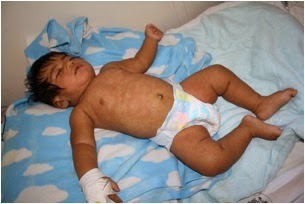 A 3 month old boy at the National Referral Hospital (NRH), Measles Ward. It is hard to know the pain and discomfort three month-old Peter* (real name not given to respect privacy) is going through. But just looking at the rash all over his body gives you an idea. Peter is among many children infected with measles and admitted at the National Referral Hospital in Honiara, Solomon Islands. A special measles ward has been set up to deal with a terrible outbreak. But it is not big enough and dozens of children have to be placed somewhere else along the emergency unit, either on a bed in the corridor or on the floor. Others have to be taken back home since there is simply no space for them. As I entered the Ward, Peter’s mother carefully and gently laid him down to sleep and with a sigh of relief turned around to look for something to drink and eat. For the past few hours, she was struggling to stop his crying and get her baby to sleep and it was obvious that she was exhausted. Peter’s parents noticed something was wrong with him over the weekend when he got a high fever: “We were worried because he refused to eat and was very grumpy. We could also see what looked like small red patches along his neck and chest and that’s when we brought him here to the hospital,” his mother told me. When I met Peter and his parents on September 1st, the measles had spread to his legs. “Just yesterday when we brought him in the red rash could only be seen on his neck and chest but now it has spread down to his feet,” his concerned father explained. As I made my way out from the hospital through the emergency ward, I saw a mother sitting on the corridor floor of the emergency ward with her small son on her lap. “We have been here for more than an hour waiting to see the nurse and because the seats are all occupied I have to sit with my son here, I do hope a nurse can look at my baby soon,” the mother explained with a worried look. Since the outbreak began in July, two children under 3 months old have died due to measles related complications. As of September 6, 2014 nearly 1,000 cases of measles have been reported to the Ministry of Health and Medical Services Surveillance Unit and with measles being a very infectious disease. 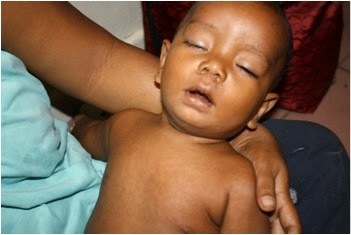 Measles cases have been reported in Malaita, Guadalcanal, Isabel, Western, Temotu and Renbel Provinces. The Ministry of Health and Medical Services (MHMS) is conducting Supplementary Immunisation Activities, to include everyone from 6 months to 30 years of age across the country. In addition to the dedicated nurses, doctors and other health care workers who are doing their best to both prevent and treat cases, others are working behind the scenes. UNICEF is working with the MHMS and WHO, and has distributed 65,000 measles and rubella (MR) vaccines from its regional stock in Fiji, and is procuring additional 200,000 MR doses on an emergency basis. The Government of Fiji also provided 50,000 MR vaccines and two major international donors have committed funds. The vaccination campaign is a massive effort and requires everyone’s cooperation – every Solomon Islander needs to get the word out and encourage or help everyone 6 months to 30 years old to get vaccinated! Together we can stop this terrible outbreak. If you or your child is aged 6 months to 30 years of age, go to one of the eight satellite clinics in Honiara or if you live elsewhere, to your health clinic for a measles vaccine. The Honiara satellite clinics are located at: Art Gallery, Burns Creek Community Field, Kobito Community Hall, Kukum Field, Lawson Tama Field, Panatina FOPA village, Rove Police Club, and White River School. If your child received their first dose of the measles vaccine more than one month ago, take them to a clinic for a second dose. The vaccine is free, safe and efficacious; the best protection against measles. If you have symptoms of measles (high fever and rash on face and body, plus runny nose, red eyes or cough) visit your health clinic and keep away from others.